ItSpace creates a network of pages within the social networking site MySpace. Instead of featuring people, the pages feature everyday household objects. Each page has a photo of the object, a description, and most importantly, a 1-minute piece of music composed of recordings of the object being struck and resonated in various ways. All the pages, or objects, are 'friends' with each other, so that visitors who discover one object may jump to the others by clicking on the 'friends' pictures at the bottom of each page. You are invited to create new ItSpace pages with pieces made from your own household objects and link those in as 'friends' of the original set of objects. You are also invited and encouraged to remix and combine existing objects into new musical compositions. Please note that the core nine ItSpace objects will only be 'friends' with other ItSpace sounding objects. They will not respond to friend requests from people or organizations. To learn how to make an ItSpace object, read on (and please read the FAQ too). ItSpace is a 2007 commission of New Radio and Performing Arts, Inc., for the Networked_Music_Review. It was made possible with funding from the New York State Music Fund, established by the New York State Attorney General at Rockefeller Philanthropy Advisors. While most people will just listen to the pieces (which is expected) everyone is invited to participate in building the ItSpace network. Participating in ItSpace will take a bit of effort, but together we can build an extended network of sounding objects inside of MySpace. There are two ways to participate: making new objects or remixing existing objects. Choose an inanimate object in your home. This means no animals and no people. Preferably the object should be something you wouldn't normally associate with music or sound. Record your object. Try to get as many different types of sounds out of it as you can. Create a short piece of music composed of sounds from the object. Create an email address for your object. Yahoo Mail and Gmail serve this purpose well. Create a MySpace band page for your object using the new email address as the login. Title the band "itspace_somename" where somename is the name of your object. Be creative here as you will need a different name from any existing objects. Upload the object's photo and piece to the MySpace page. Make sure you include a link to this Creative Commons license somewhere on your page. This is necessary to join the network of ItSpace objects. While logged in as your object, choose an existing ItSpace object and click 'Add to Friends'. Please add no more than two of the nine core ItSpace objects as friends. You can befriend as many non-core ItSpace objects you like. Download one or more ItSpace pieces from the MySpace music player. Remix the piece or create a musical mashup of multiple pieces and encode it as an mp3. Title the band "itspace_somename" where somename is the name of your remixed object. Be creative here as you will need a different name from any existing objects. Upload a photo of the remixed object and the mp3 to the MySpace page. Make sure you include a link to this Creative Commons license somewhere on your page. This is necessary to join the network of ItSpace objects. While logged in as your ItSpace object, go to the original object that you remixed and click 'Add to Friends'. Please add no more than two of the nine core ItSpace objects as friends - preferably the ones you mashed up or remixed. You can befriend as many non-core ItSpace objects you like. A gallery version of ItSpace also exists, and was completed following the creation of the online version. Click on the image below to learn more about it. Will ItSpace objects be friends with MySpace people or bands? What does your license mean? Why don't you tell me what tools to use to make a new piece? How do I remix an mp3? You don't provide the original samples or a CD quality soundfile. Are there any rules or guidelines as to what I can and cannot do with the samples in making a new ItSpace piece? If I create multiple remixes or mashups of an ItSpace object, do I need a new ItSpace page for each one? Why do I need to create a new email address for my object? No. The nine core ItSpace objects are not interested in being friends with MySpace people or bands. They only want to be friends with other ItSpace objects. If you want to be a friend of a core ItSpace object, you will have to make a new or remixed ItSpace object and become a friend through it. If you make your own ItSpace object, it is up to you whether or not you want to restrict its friends to only other ItSpace objects. The Creative Commons Attribution-Noncommercial-Share Alike 3.0 Unported License ensures that no music made for ItSpace can be used commercially in any way	without prior permission of the author. If you compose a completely new piece (i.e., you don't remix an existing one), you may do with it as you please (even sell it), but you will need to release it under the same Creative Commons license in order to be 'friends' with one of the core ItSpace objects. The license also tries to ensure that if you remix someone elses work, you give them the appropriate credit. Furthermore, any remix of a work that uses the Creative Commons license is automatically bound by the conditions of the license itself. Audacity is a sound file editor, something that is typically used to clean up sounds and recordings before putting them into a multitrack workstation or other compositional environment. Audacity is supported on all three major operating systems. n-Track Studio is a multitrack workstation for the Windows platform. It costs $64, which is fairly inexpensive as far as digital audio workstations go. GarageBand for OS X is not free, but it does come pre-installed on all new Macs. Ardour is a popular full-featured multitrack digital audio workstation for Linux. That is one of the aesthetic choices I made with the ItSpace. The mp3s of the original pieces can easily be converted to various sound file formats with software like Audacity. Remixing will require cutting up the original pieces and trying to be inventive from that perspective. Since the original file is an mp3, the quality loss from the compression may be audible, but that is aesthetically interesting to me as it results in other artifacts added to the sound. I hope it will be interesting for you too. If you would rather work with pristine recordings, then you may prefer to record your own objects and create a brand new ItSpace member. Other than the use restrictions laid out by the Creative Commons licence, such as no commercial use, there are no hard compositional rules. The nine core objects chose to make their characteristic sounds very evident in their pieces. This means that they processed their sounds but not to the degree that they lost an audible connection to the source material. Ideally, new ItSpace objects use only their own sounds and do not use accompaniment from traditional instruments like guitar, drums, piano, etc. Yes. Ideally each ItSpace page is about a single unique object or a single unique remix or mashup. Simply put: one page, one piece. If you don't already have a MySpace page, then you may use your current email address to set one up. However, if you do currently have a MySpace page associated with your email address, you will need to create a new address in order to create a new MySpace page. 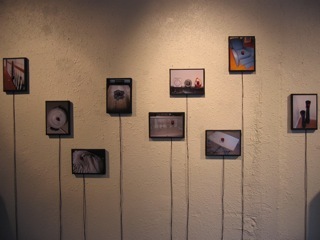 Each of the nine original objects in ItSpace have their own email addresses. This is because MySpace does not allow more than one account per email address. Both Yahoo Mail and Gmail can be set to forward copies of emails to another address, so you can set your new address to forward any received emails to your primary email address.